The search for perfect Mother of the Groom shoes has been this vacation week's prioritiy. After several purchases and returns, I'm feeling good about the latest choice. The shoes seem steady for standing in a reception line, and for being ushered to my seat without tripping. I would not want to wear them in severe weather, though. 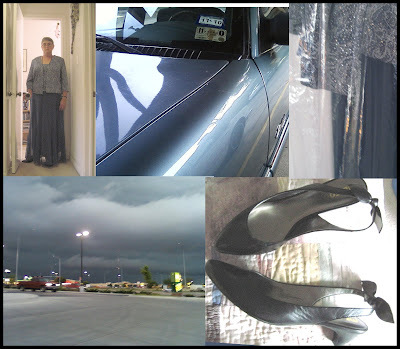 During Weather Watch Radar radio broadcast interruptions I realized my dress for Danger Baby's big event is the color of a threatening Nebraska June thunderstorm. On the tag, the dress color is "Pacific". Since I've never been west of Moab, Utah, I don't know diddly about "Pacific". It's about the same for the new collegiate athletic conference realignment. My dress for the upcoming wedding resembles my '96 Buick Skylark with potential hail up to golf ball size. This weekend I get to attend the Texas Ballet Theatre's version of "Sleeping Beauty". I don't want to look like Maleficent, the bad fairy in Disney's "Sleeping Beauty", but maybe if the mother-in-law looks like a tornado watch, the marriage will have fewer storms!